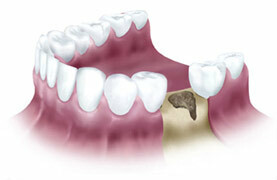 This tooth is unrestorable due to the large amount of bone loss that is missing on the front side of the tooth. The tooth is removed and there is a large hole in the bone that needs to be filled in. The defect in the bone is filled in with bone used from various sources. The gum is the covered up. 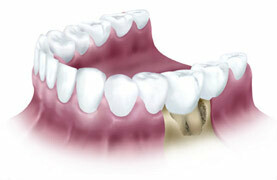 The goal is to preserve the height of the bone so that an implant can be placed. Autografts are those where the bone to be grafted to the jaw is taken, or harvested, from your own body. The donor site, which is where the bone is harvested from, is usually the mouth or the hip. This is your own bone and is very compatible with your body. Autografts are generally the best grafting technique and usually result in the greatest regeneration of missing jawbone. Allografts are taken from human donors. Many countries have donor programs where you can specify that in the event of your death, parts may be harvested from your body to save or improve the life of others. Heart transplants are one type of allograft. This can represent one of the greatest gifts you can ever give. Bone obtained in this manner undergoes rigorous tests and sterilization. Your body "converts" the donor bone into your natural bone, thereby rebuilding your resorbed jawbone. Alloplastic grafts are made from inert, man-made synthetic materials. The modern artificial joint replacement procedure uses metal alloplastic grafts. For bone replacement, a man-made material that mimics natural bone is used. Most often this is a form of calcium phosphate. Depending on how it is made, it may be "resorbable" or "non-resorbable." That is, your body may or may not replace the alloplastic graft with your natural bone. In those cases where it is not replaced, it acts as a lattice or scaffold upon which natural bone is built. 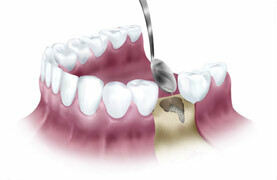 In either case, the end result is to create enough bone for the placement of dental implants. Xenografts are harvested from animals. The animal bone, most commonly bovine (cow), is specially processed to make it biocompatible and sterile. It acts like a "filler" which in time your body will replace with natural bone. 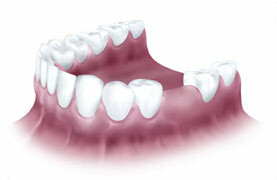 After this replacement process is complete dental implants may be placed to support the missing teeth.